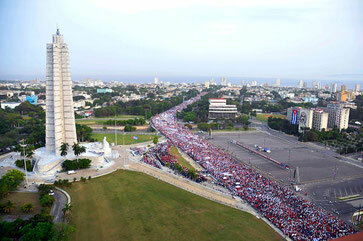 Participants in the country’s largest mobilization of the year, began their march at 7:00 am this morning, with flags, banners, signs and t-shirts referring to May Day and this year’s maxim United in the construction of socialism, as well as the release of the Cuban Five, until recently unjustly imprisoned in the United States. Ulises Guilarte de Nacimiento, secretary general of the Cuba Workers Federation (CTC), opened the march reaffirming the internationalism of Cuban workers, and support for the process of integration unfolding in Latin America and the Caribbean. He expressed satisfaction with the U.S. government’s decision to modify its strategy toward Cuba and begin the process of reestablishing diplomatic relations, opening a new stage in the struggle to end the blockade imposed more than 50 years ago. Cuba is one of the countries where International Workers Day has been celebrated on May Day since 1890, to commemorate the martyrs of Chicago’s Haymarket Square, as called for at the 1889 International Socialist Congress in Paris. The CTC and its national affiliates, political and grassroots organizations have organized massive mobilizations on May Day since the Revolution triumphed in 1959 and the working class assumed power.